Cases indicate the grammatical functions of nouns and pronouns according to their relation with rest of the words in a sentence. In modern English, there are only three kinds of cases. When a noun or a pronoun works as a subject in the sentence, a subjective case appears. Louis works in the management. He works very hard for the company. I love to watch movies in my free time. Reading is a very good habit. When a noun or a pronoun works as an object in the sentence, an objective case appears. Robert does not eat burgers. 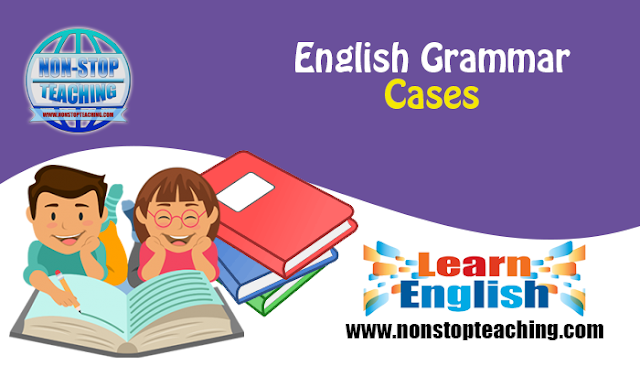 Possessive cases indicate a relationship of possession or belongingness between two nouns or a noun and a pronoun. My family does not approve this. Shaun’s wife has passed away. Note: The pronoun changes its form in different cases. There is another kind of case. It is called the vocative case. This case is similar to the subjective case in term of spelling. The vocative case indicates a person being addressed directly by his/her name. This name is separated by a comma. Robert, could you please open the door? You, watch out the bus.